How do I find the perfect size of frame? 1. Measure your old pair of glasses to get the dimension which fits you the best. By having these numbers, you can easily find the closest match on our website. Please see the sketch for how to understand the measurements of a frame (2-3mm difference is acceptable). Diagonal length refers to the straight line length joining two opposite corners of the lens. 2. You can also read the dimensions of your old glasses for help. The size is usually listed on the arm of temples. 54 stands for Lens Width, which is the horizontal width (in millimeters) of each lens. 18 stands for Bridge Width, which is the distance (in millimeters) between your two lenses. 140 stands for Temple Length, is the length (in millimeters) from each screw to its temple tip. 3. Try on glasses at a local optical store and mark the size that fits you. Then find the similar size on our website. 4. We divide our frames into 3 categories: Narrow, Medium and Wide, which represents the total width of the frame. You can sort by different size. What's more, you can filter size of each part when selecting frames. How to specify Frame dimensions/size? If you already have a pair of glasses fit your face well, you may compare the measurements to help you find the suitable frames at our site. Usually, most eyeglasses brands print the measurements on the inside of the temple arm and the difference of the total width within 5mm is acceptable. However, since different suppliers have different measurements for the frame size, we measure the size again when we get the frames. And then we upload the accurate measurement on our website.Therefore, you could rely on the measurement on our website because it is more accurate. Temple Length: the length of the temple from each screw to its ears. Lens Height: the vertical distance of the lens, frame for fitting bifocals or progressive lens should be at least 30mm in height. Total Width: the width of the frame from one screw to the other, ensuring the frame fits the width of your face. It is very important for you to select the suitable frames online. Diagonal Length: the straight line length joining two opposite corners of the lens. When purchasing single vision eyeglasses, wearers with higher prescription strength should be aware that large frame with a wider lens is not recommended while smaller and narrower lens width will contribute to a thinner edge, lighter weight and greater comfort. For the wears that have a comparatively small PD (the distance between your pupils is less than 58mm), please pay more attention to the total width of the size as a larger frame may not match your PD. Smaller frame with the lens width of 50mm or lower should be considered as the first choice in order to make sure the accuracy of your prescription. How to read eyeglasses size? Typically there will be three standard numbers imprinted on one of the temples or the bridge, indicating respectively the sizes of three frame parts. A typical example is 50-21-142. All sizes are marked in millimeter. a. Lens size: The first number 50 represents the lens size, which is also called eye size or lens width. The lens width is the most exact name of this size, describing precisely the distance between the vertical sides of a rectangle containing the lens shape. It is important to differentiate it from lens height. A large lens for a big guy usually has big sizes at both dimensions. Lens size typically ranges from 44 to 52. In rare cases, big and tall guys need to take a frame with a size of 58.
b. Bridge length: The second number 21 represents the bridge size. Other sayings include bridge length and bridge width. In detail, it is the minimum horizontal distance between the nasal surfaces of the rims. This size varies only slightly because people's noses will hardly differ significantly. When the frame is sitting too high on the face, it is necessary to increase this bridge size. In opposite, a shorter bridge is needed when the frame sits too low on the face. c. Arm length: The third number 142 describes the length of an arm or temple. This is the whole length of a temple, consisting the length of the bend and the length of the drop. Most people can get fit into a size of 140, but a big guy may require 155 and even more. 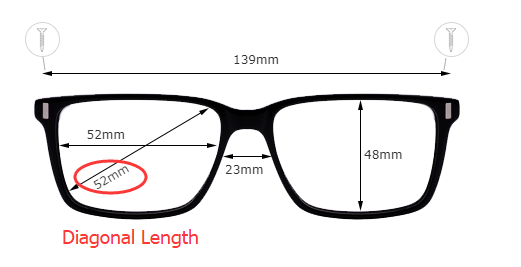 How to measure eyeglasses size? Get a metric ruler that is capable of measuring millimeters, the universal unit of measurement set by worldwide frame manufacturers and opticians. Place the frame on a smooth table or level surface. It is acceptable whether the arms are closed or open. Align the starting end of the ruler with the one side of the eye rim at the outer edge, and measure the distance to the other side of the eye rim. The bridge length can be measured in a similar way. It is necessary to measure the length to the bend and the length of the drop respectively. 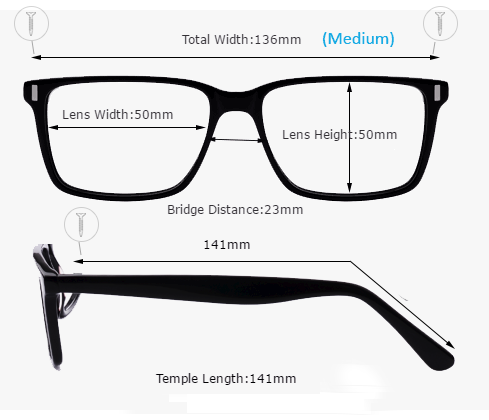 At some online optical shops, customers are required to provide the frame sizes according to personal facial size. This is the necessary information for opticians to fit a pair of comfortable glasses. Can I rely on the try-on function to pick frame size? No. The try-on function is just for style reference, not size!